Disasters don't come cheap. Lost revenue, reduced productivity and data loss quickly add up. That's why more IT departments are prioritizing business continuity and disaster recovery in 2011. "Today, business process owners and managers won't accept downtime and data loss that lose revenue, reduce employee productivity or damage the company's reputation." 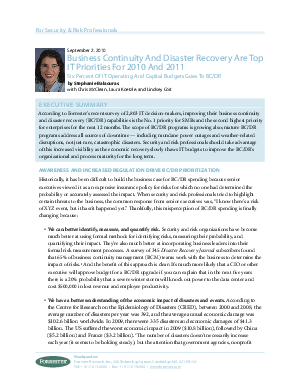 This Forrester Research white paper examines IT's new emphasis on business continuity and disaster recovery (BC/DR) planning.